Addiction is common for inmates in prisons. Statistics show that many inmates deal with substance abuse problems, but few actually receive treatment while they are incarcerated. However, addressing substance use disorders during this time and after their release lowers their risk for relapse. Prisons are rife with people convicted of drug crimes. These individuals may have been incarcerated for a range of drug-related offenses, from driving under the influence of alcohol to possession of drug paraphernalia. Some inmates imprisoned for drug crimes do not have a drug problem. But addiction is still common among prisoners. 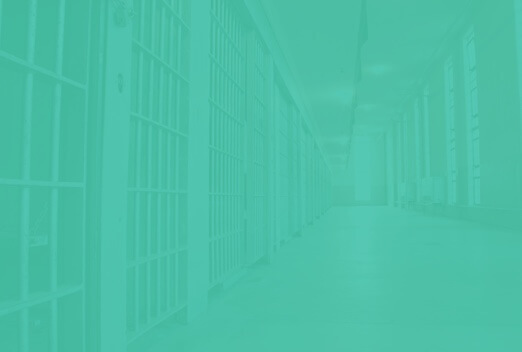 According to The Center for Prisoner Health and Human Rights, about half of people in prison or jail meet the criteria for substance abuse or dependence. Many people with addiction also have a mental health disorder, such as depression or post-traumatic stress disorder. About 45 percent of inmates in local jails and state prisons simultaneously grapple with a substance use and psychological disorder, according to the National Institutes of Health. 45% of inmates in local jails and state prisons simultaneously grapple with a substance use and psychological disorder. However, many prisons do not provide inmates who battle addiction with proper evidence-based treatment that could save their lives. Medication-assisted treatment, which can help control withdrawal symptoms during detox, is uncommon in U.S. prisons. Research shows that in-prison treatment can save lives. Inmates who receive treatment during incarceration have a reduced risk for further substance use, experiencing relapse and drug-related death. Many prisons support people battling addiction. A number of correctional facilities today offer psychotherapy sessions, religious ministry meetings and 12-step programs such as Alcoholics Anonymous to inmates with substance use problems. Alcoholics Anonymous meetings are common in correctional settings. These meetings aim to help inmates live a sober life in prison and after their release. This program allows prisoners to learn more about the underlying cause of their drinking problems and strategies to avoid alcohol abuse. In addition to 12-step meetings, federal prisons offer a number of programs designed to assist inmates in overcoming a substance use disorder. Many prisons provide educational classes about the dangers of substance abuse. This program also helps the Federal Bureau of Prisons identify prisoners who may need more extensive treatment. This program uses cognitive-behavioral treatment, a psychotherapy that aims to change behaviors, to help prisoners battle addiction. Held in a group setting, nonresidential drug abuse treatment is for inmates who have short sentences, have had a positive urinalysis exam, may not meet the criteria for a more extensive treatment program, or are nearing release from prison. Residential drug abuse program is the most intensive drug treatment program offered by the Federal Bureau of Prisons. In this nine-month program, inmates learn to live in a social community. They participate in half-day programming and half-day work, school or vocational activities. Community treatment services provide continued care to individuals released from prison who enter halfway houses or home confinement. Through the program, certified addiction specialists and specialized agencies offer services such as crisis management and mental health therapy. Well-designed prison treatment programs reduce relapse, criminality, inmate misconduct and recidivism — the likelihood that a convicted criminal will reoffend. They also increase levels of education, mend relationships, boost employment opportunities upon release and improve overall health. Research shows that residential prison treatment is cost-effective if prisoners continue treatment after their release. The cost of treatment pales in comparison to the cost of incarceration. Rehab helps prisoners overcome drug use and reduces the economic burden of recidivism. According to the report by the National Center on Addiction and Substance Abuse, if all prisoners with substance abuse problems received addiction treatment during incarceration and aftercare upon their release, the United States would break even on costs if just over 10 percent were employed and avoided drugs and crime. But not all addicted inmates receive treatment. The CASA report found that just 11 percent of inmates with substance abuse problems, including addiction, received treatment at federal and state prisons or local jails. In a 2014 editorial in The Washington Post, renowned addiction specialist David Sack suggested that prisons create an evaluation system to identify substance use disorders and underlying problems that contribute to addiction, such as trauma or anxiety. Sack also said prisons should employ trained addiction specialists who know how to use evidence-based treatment. Additionally, he recommended that more correctional facilities consider programs that support inmates after their release to help them avoid relapse. Prisons do not offer treatment plans as comprehensive as those found at traditional rehab centers. Rehab facilities include evidence-based approaches that cater to the client’s specific needs, which may include co-occurring disorders. Treatment often comprises a structured detoxification phase, psychotherapy and support group meetings. Prisons have used evidence-based methods of treatment, such as cognitive behavior therapy and self-help group meetings, but many lack detox programs. Detox can be painful for someone with addiction. During this process, individuals experience withdrawal symptoms that may include insomnia, diarrhea, cramping and hallucinations. Some prisons employ medication-assisted therapy to help inmates deal with these symptoms. 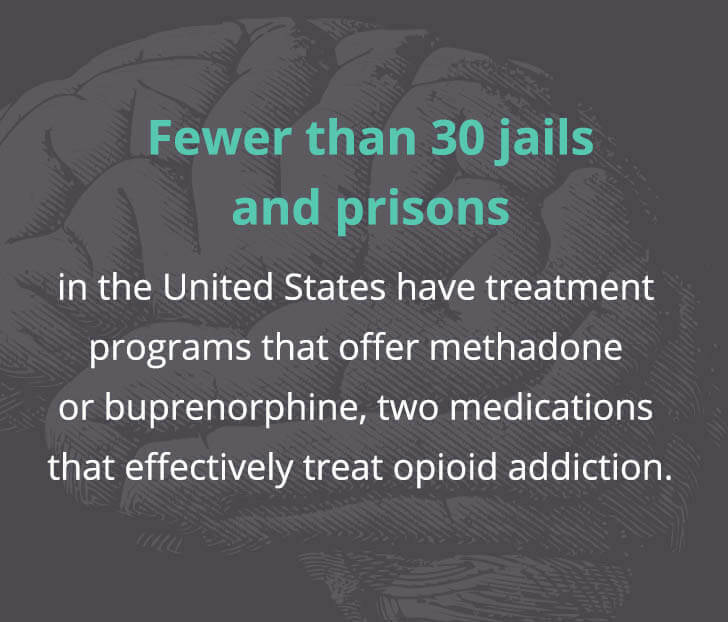 However, a 2017 report by The New York Times found that fewer than 30 jails and prisons in the United States have treatment programs that offer methadone or buprenorphine, two medications that effectively treat opioid addiction. As of March 2017, just four state prisons use these medications. Methadone weans people off their drug of choice by reducing drug cravings without producing euphoria. Methadone treatment programs have proved effective in reducing arrests and increasing employment among former inmates. Rhode Island Department of Corrections offers a medication-assisted treatment program. Inmates battling opioid addiction have access to a range of medications that treat their addiction, including Suboxone, a combination of buprenorphine and naloxone. A 2012 study published in the journal Substance Abuse found that providing inmates with methadone treatment in the weeks before their release had significant benefits. These individuals were more likely than prisoners referred to treatment at the time of release to enter rehab upon release. Another study, published in the journal Addiction, also showed advantages to offering methadone in prison. Researchers found that prisoners who received counseling and methadone treatment were more likely to be retained in rehab than were inmates who received counseling and a transfer to methadone treatment upon release. Those who received methadone while incarcerated were also less likely than the other group to fail a drug test. Recovering from addiction can be difficult. Upon their release, prisoners with substance abuse issues often return to environments that trigger drug cravings. This can lead to continued drug use and overdose. Research shows that more than half of inmates with a history of addiction relapse within a month of their release. 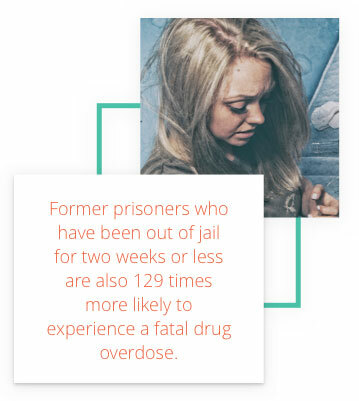 Former prisoners who have been out of jail for two weeks or less are also 129 times more likely than the general population to experience a fatal drug overdose. Completing drug rehab is a proven method for overcoming substance use disorders and reducing recidivism. In-prison treatment combined with aftercare services can also reduce recidivism rates. But those who do not receive treatment in prison can still attend rehab with aftercare programs upon their release. Aftercare provides continued care that may include outpatient care and 12-step programs. These allow ex-prisoners in recovery to communicate with and learn from people in similar situations. Support is important for ex-prisoners in recovery. Individuals who seek aftercare resources, such as 12-step meetings or individual therapy, upon their release have a greater chance of living healthy, drug-free lives.